Guess what? 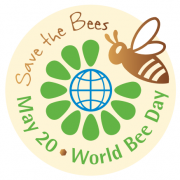 Yesterday was the first annual World Bee Day! The holiday is about spreading awareness of the significance of bees and came about as the result of a recently adopted UN resolution. 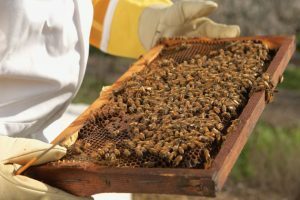 It will be on May 20th every year which is also the birthday of Anton Janša, a teacher of apiculture and pioneer of modern beekeeping from Slovenia. Why do we care? Well, bees and almond growers have a special relationship. Almond trees need bees for cross pollination and, since almond trees bloom earlier than many other plants, almond blossoms provide the nectar that bees need at a time when there isn’t that much otherwise for them to eat. In fact, almond nectar is particularly nutritious for bees and their hives typically become much healthier after visiting the almond groves. This is important because a third of the world’s food production depends on bees. Effective pollination increases the amount of food that can be healthily produced without excessive dependency on chemical fertilizers and other practices that might damage the environment. It improves the food’s quality and also seems to encourage plants’ resistance to pests. In our own orchards we have found that the natural practices we use to attract bees and other helpful insects has the effect of keeping invasive crop-damaging insects away. That helps us avoid the use of pesticides and provide healthier organic products to our customers.